 A smart, splendid account of the world's most famous--and quirkiest--serious music festival. Less than a century elapsed between the age of Mozart, when musicians were the servants of great princes, and the age of Wagner, who made royalty his servants and idolaters. The crowning act in this unparalleled social role reversal was the erection in the early 1870s of a temple in which to stage the Meister's lengthy music dramas, particularly the four-opera, 19-hour Ring cycle and the ``sacred festival play'' Parsifal. It was (and still is) a peculiar, wooden barnlike structure on a hill in a drab, sleepy, and otherwise undistinguished provincial German town. Yet for 118 years, the Festspielhaus has hypnotized the world's musical and social aristocracy, who brave the August heat, the uncomfortable seats, and the cramped accommodations to sit in hushed reverence for hours of music--afraid to cough or stir for fear of their neighbors' icy glances. It's all very German, and Spotts, an associate of the Center for European Studies at Harvard, does not slight the story's darker side: Bayreuth's symbolic significance as a shrine for German nationalism and, ultimately, fascism and anti- semitism. Richard Wagner died before the festival was a decade old; its management passed to his widow, Cosima, and later to his children and grandchildren. 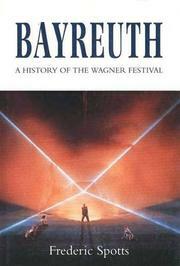 Unsurprisingly, given his own craziness, Wagner spawned a sizeable population of difficult characters and a few genuinely talented artists, in particular his grandson Wolfgang, a superb director who dragged Bayreuth into a new age of theatrical innovation after it had been tarred by the racist brush of the older generation. Spotts decribes them all perceptively and is also good on the unusual acoustics of the theater itself, with its famous hooded orchestra pit. An important, elegantly written, deeply engrossing cultural history of this unique (and uniquely strange) cultural institution.